While this is not normally any sort of political forum, even the world of vegetable gardening is not immune to politics. 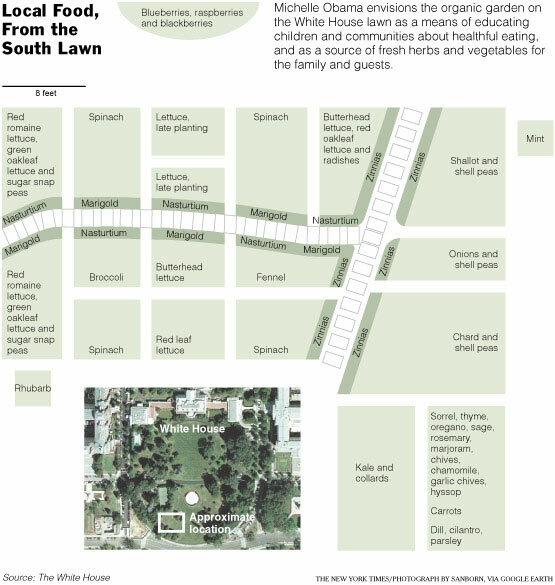 Today, First Lady Michelle Obama will break ground on the first vegetable garden at the White House since Eleanor Roosevelt’s Victory Garden. But as this blueprint indicates, there will be no tomatoes. The First Lady says “A real delicious heirloom tomato is one of the sweetest things that you’ll ever eat… and my children know the difference” So why not grow some, eh? So much for re-election. Forget the AIG mis-calculation, Jerzeetomato.com will not be endorsing the 2012 Obama ticket until this wrong is righted. If then. And there’s too much lettuce in the plan, too. Seriously, though, we admire the commitment to local produce and healthier eating. We just feel that commitment should include tomatoes. Well, that says it all.If they cannot (or choose not) to grow tomatoes, with all that DC heat, and I’m sure, am ample quantity of manure, they derserve what they get out of THAT garden. How Soviet of them. This follows right along with the playbook (manifesto?). When times are hard you give the peasants more of the collective farm to grow for themselves. Lenin would be spinning in his grave if he wasn’t pickled and lying in Red Square. Wait, wait – it has all become clear – the dog would eat the tomatoes, hence no tomatoes.